Dayan Jayatilleka, the incorrigible nitpicker’s performance at the Nugegoda meeting of the United Peoples Freedom Alliance (UPFA), organized by the discards of the Sirisena coalition to bring back the tyrannical Mahinda Rajapaksa as the Prime Ministerial candidate at the next general elections, could have put Joe Abeywickrama’s best cinematic performance to shame. He was tasked to read out a simple message from President Mahinda Rajapaksa, and our dear Dayan, the nitpicker takes the podium, reads out the message with such drama, that Mahinda Rajapaksa, if present in person would not have been able to perform better with such rhetoric exhilaration. A nomination for the next Oscars would be very much in line. 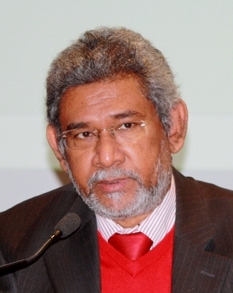 Dayan, continues to be a political thorn, as far as the majority of Sri Lankans are concerned. 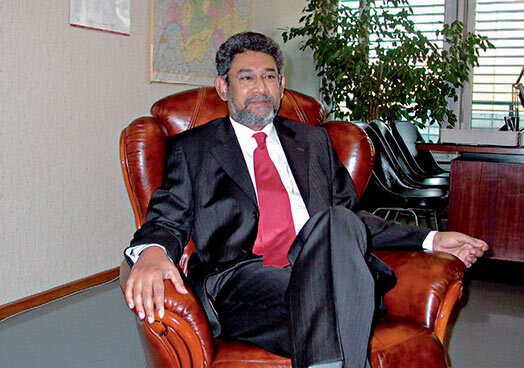 His aggressive attacks and accusations on the Mahinda Rajapaksa administration after his un-ceremonial dismissal from his diplomatic postings in Geneva and Paris brought a lot of sympathy towards him as he did well to defend Sri Lanka in Geneva at the UNHRC sessions, when he was functioning as the permanent representative of Sri Lanka. His sudden turn around to stand by Mahinda and defend him at any cost has exposed his hidden agenda of being the “wolf in sheep’s clothing”, or was it another Vasudeva gimmick to continue milking state resources to replenish his thirst for luxury. The media, unfortunately has played right in to Dayan’s agenda and has provided him with much space to achieve his hidden objective of portraying Mahinda Rajapaksa as the savior of the nation. Two private television channels, primarily are the cause for this mediocre political analyst to gain so much prominence. One channel of-course has an axe to grind with Prime Minister Ranil Wickremesinghe and will use anyone or anything to destroy Ranil. What they failed to achieve with millions worth of financial backing and airtime through Sajith Premadasa, Maithri Gunaratne and Shiral Lakthilake, they are probably succeeding through Dayan Jayatilleka. Dayan conveniently ignores the responsibilities of Rajapaksa as President who failed to ensure that rule of law prevailed, democracy, human rights, independence of the judiciary, police and media are prerequisites for an enlightened society to live peacefully. He had been trained to lie for his country in his diplomatic postings and now he is using his newly acquired skills to lie to the nation about a despotic leader, who along with his family has looted enough to buy a few Islands in the Seychelles and live in luxury for generations to come. I consider Dayan to be an extremely intelligent and capable intellect, but his sudden bootlicking of Mahinda has turned his former colleagues and friends in media and civil society to look at him with total disdain. A man who stood by democracy, human rights and ethnic harmony has overnight joined a bigoted band of political discards to spearhead a racist and extremist campaign to bring back a tyrannical leader, Mahinda Rajapaksa back in to power to meet their narrow personal objectives. Dayan’s lost love for Prime Minister; Ranil Wickremesinghe is no secret. He despises Ranil as if he is a scourge that would destroy him. This dates back to many years and it is difficult to fathom as Dayan was also a stooge of the late President Ranasinghe Premadasa, and Ranil was an ally of Premadasa when Lalith Athulatmudali and Gamini Dissanayake challenged and battled for the UNP leadership. Dayan is a habitual betrayer, and history is clear about his betrayal of Vijaya Kumaratunga’s Sri Lanka Mahajana Party when he crossed over to support Ranasinghe Premadasa after he returned from exile in South India. He left the Sri Lanka Mahajana Party voluntarily but not without betraying Vijaya Kumaratunga, which led to his killing in February 1988. So, few expected him to continue his hatred towards Ranil, but this wound seems to have festered beyond healing. His support and commitment to the 13th Amendment that also cost his lucrative position in Geneva should have made him friends with the United National Party (UNP) and Ranil Wickremesinghe, but it seems that, his support for it was purely to satisfy his handlers in India. On the other hand, it is also alleged that he pissed off the Israeli’s that cost him his job as the permanent representative in Geneva. Whatever, are the reasons for his dismissal, his arrogance and superiority complex in him that is the root cause of his diplomatic debacle. There’s no difference between Wimal Weerawansa, BBS Gnanassara and Dayan Jayatillake. There is one more to this clan of bootlickers Udaya Gammanpila. Bunch of disgraceful characters. Excellent work, except for the part you say he is an intellect. Who calls donkeys like these intellectuals. His pompous display of bigotry standing alongside with BBS Gnanasara, and Wimal Weerawasnsha showed his intellectual bankruptcy. I knew that he has bone to pick with Ranil because, RW didn’t let his uncle JR to pardon DJ for working against the gov of Sri Lanka. It has something to do with asking for Ealam working with Indians to bring country down. I think he is now trying to wash all his previous sins in front of the nation by doing a total 180 turn and by speaking against even the deserved rights of our Tamil community. And as non Buddhist himself, he has become ultra nationalistic and pro-Buddhist than us who are born Buddhists who understand the legitimate grievances of the minority populations of Sri Lanka. So Vijaya’s death and his hand in exposing him explains why CBK doesn’t want this guy anywhere near her administrations. I was wondering why he was against CBK this much, knowing DJ normally doesn’t disagree with people purely based on principle but his. He just like his friend rajiv thorw tantrums to be recognized. Pran, he was part of the so called Naxalites group that JR had branded Vijaya and his associates including me. Most were hundred down and I was not a significant figure, so I survived. These guys ran away to India through RAW who provided them sanitary. I do not think he had any direct hand in Vijaya’s assassination, but his betrayal by giving information to the JR-Premadasa coterie could have led to Vijaya as suspected by many. Thanks, Granville. I remember reading about the Naxalite connection as a child, wasn’t he jailed by JR for the very reason?. But it wasn’t established. So this guy is the one gave out the names. What else can you expect from DJ. Many SLns never believed Vijaya was assassinated by JVP (Just like Premakeerthi) and thought that someone who saw his bright future as a politician a hindrance to their advancement took care of him. In a way I am glad DJ chose MR at the end after being snubbed by MS and RW/CBK. After badgering MS camp at CT day in day out this disingenuous guy went to meet with MS ready to change ties to reap benefits of new gov. Fortunately, MS had politely declined FM request. May be JVP knew the his duplicity right through him. Right now he is singing AKD praises, I am hoping AKD will not fall for this singing fox. Excellent work, except for the part you say he is an intellect. Who calls donkeys like these intellectuals. His pompous display of bigotry standing alongside with BBS Gnanasara, and Wimal Weerawasnsha showed his intellectual bankruptcy. I knew that he has bone to pick with Ranil because, RW didn’t let his uncle JR to pardon DJ for working against the gov of Sri Lanka. It has something to do with asking for Ealam working with Indians to bring country down. I think he is now trying to wash all his previous sins in front of the nation by doing a total 180 turn and by speaking against even the deserved rights of our Tamil community. And as non Buddhist himself, he has become ultra nationalistic and pro-Buddhist than us who are born Buddhists who understand the legitimate grievances of the minority populations of Sri Lanka. So Vijaya’s death and his hand in exposing him explains why CBK doesn’t want this guy anywhere near her administrations. I was wondering why he was against CBK this much, knowing DJ normally doesn’t disagree with people purely based on principle but his. He just like his friend Rajiv throw tantrums to be recognized. Would you care to elaborate how this guys is connected with Vijaya Kumaranathungas untimely death. This vermin needs to be exposed for who he really is. Every government tried pin their paramilitary killings either on JVP or LTTE. Just like UNP got away with Lalith Athulathmudali, Vijaya,Premakeerthi, Richard De Soyza. And MR and Basil, GOTA got away with Lakshman Kadiragamar, Lasantha, Fernandopulle, Janka Perera and many other political assassinations in SL. How can you call him an intellect when he doesn’t get this simple fact. The reason I am addressing Mr Upul Jayasooriya is because of the possibility that you are the former President of the BASL. If so, I know you personally. My comment digresses from DJ and moves to something far more important. Justice will not be served when Investigators are Partial. Such partiality will lead to a Kangaroo Court and a wild west style lynching. Please read the following and give your views. This is the ICC Statute, which of course is the International Law. Nowhere does the ICC say “deliberately moving civilians towards military targets” is the Sine Qua Non for proving that the War Crime of employing a Human Shield has been committed. The ICC requirement is, the use of the PRESENCE of a CIVILIAN. Thus clearly the UNSG’s POE has had a VERY STRONG INCENTIVE to MISINTERPRET the ICC Statute and give a opinion favourable to the LTTE Terrorists and their Financiers. This is quite a strong reason to oppose a UN investigation. I have just mentioned one instance of partiality, others exist. Thank you and I totally agree with you on the UN and International community’s bias towards the Tamil Diaspora. I am not the bar association’s Upul either. I am a retired old hand from Kandy. The reason I say stand for an international inquiry is that there wouldn’t be an end to this assault on us by some sections of the Tamil Diaspora. We need to face it as a nation and challenge them on their bias. That we certainly are able to do with super diplomats like Jayantha Dhanapala advising the current president. The first thing we need to do is appoint career diplomats to engage the governments in the west to explain our stand. These stupid political appointees number over 35 couldn’t even think of defense, leave alone their capability. Because of the politicization of the foreign service, we may not be able to find good enough career diplomats, but there are plenty of them who retired during the last 10 years. They should be brought back for atl east a two year term and ask to fight our diplomatic battle. Though I agree with most of what you have written, I disagree with allowing investigations UNLESS Impartiality is guaranteed. At the moment it is riddled with injustice. You cannot win with a loaded dice. The ability to beat the charges exist provided the system is impartial otherwise the truth will be buried 6 feet deep. what progress MR regime made with regards to peace and Reconciliation ? With regard to burning of the library even though it is rebuilt who will bring back the books the army officers deliberately destroyed ? Further with the hard work of Kadirgamar (not that of DJ or MR regime ) the LTTE was banned internationally .No right thinking citizen will ever say what the LTTE or other rebels did to Dalada Maligawa, Maha bodies or Fort Railway Station. For that with the help of International community the GOSL has destroyed LTTE by foul means as well as fair means. Still investigations can be made and any persons involved are alive punish them. International Community will help you based on international laws. Finding truths in the horrible incidents or events that happened in the past, whether in the South or North is important for peace and unity of the country. Are you part of BBS, Sinhala Ravana and 20 other Buddhist organisations that wants MR regime to come back after what happened between 2010 and January 9th early morning ? I never thought that DJ will stoop so low. My respect for him as an intellectual today stands shattered and diminished as many men of value. DJ has now become a betrayer and a person of very low calibre. Shame, Shame. for no reason DJ was promoted by Rajapakse Media units. Today, we are becoming clear, he was not as those media men insisted. DJ is a person as Kanthaiyya made it very clear – making every effort to get drawn the media attention – placing, self describing him to be the man above the society.. That is the reason him to have added about his childhood – him to have been coming from such background. But it is pitty to see, those who themselves are said to be coming from such upper class backgrounds to fall to Wimal weeranases levels. Wimal weerawanse as many are clear – is from low educated far poor family background. His germs of hate mongering should have been born while facing his childhood brutally. That is the common problem in any developing country. But inour place, more of them are given direct acces to animate the society- though reported to be a society of higher literacy rate… anyways, the days passed since no war is there, gave a birth to more crimnals to have bred than had been before. Most of them were fertilized directly by Rajapkshe criminal mind sets. Since Rajapakshes were also not from good background – netiehr education nor elites – they were also not far from Thunmulle wimale the like. Anyways, this was the reason them to be entwined all along. Today, Thlanga Sumathipala, and other few have guts to add their thoughts that former Prez and others were not fair.. EVEN THE family rule should NOT have been… neverthless it was there- Mahinda did not listen to them, but to others.. etc.. while penisless leftists and Wimal bruwanssa together with political teenager Gommanpila (blood sucker of other grade) still feel, their survial can only be protected by Mahinda, so he should be brought back… Latter is what the current regime has to defeat next. Not even half of 5.7 milions of voters supported MR Rajapakshe would use teh same vote for his coming back – is what many feel to this day. But you never know since these peopel are left to be in dark .. fed with all wrongful info for such a long time… their recoveries can take some more time. How genuine is that desire to punish Ambedkhar? Excellent work!This man certainly outdid Joe Abeywickrama’s best cinematic performance to shame, reading out text written by himself. DJ demonstrates how low so-called intellects in Sri Lanka can go for personal gains.God save Sri Lanka from this kind of intellects. Before the election he met both Messrs. Rajapaksa and Sirisena.Perhaps he met Mr Sirisena as a ploy of Basil. But my reading is that he may have asked for a plum Ambassadorial post to which Mr Sirisena may not have agreed. Well contrary to the popular notion that he did well in Geneva to defend Sri Lanka, what he was engaged in was megaphone or Rottweiler diplomacy which did disservice to the country than service. He used to blow his own trumpet and he was a part of the problem in Geneva, not the solution. Ambassadors in Geneva before him, both career and non-career, had engaged with other delegations in Geneva in quiet diplomacy to defend the country.In the 1980s too when Sri Lanka was a pariah among the international community following 1983 pogrom, our Ambassadors in Geneva managed to prevent resolutions on Sri Lanka by quiet diplomacy. But they never went to the town. They were unsung heros. DJ instead turned a resolution against Sri Lanka into one praising the country in 2009.The West was naturally very humiliated and in following years they successfully brought in resolutions against Sri Lanka. What he should have done in 2009 was to prevent any resolution on Sri Lanka praising or criticizing it.Allowing a resolution praising Sri Lanka he opened the country to UN scrutiny. You are right, now he is engaged in another Vasudeva gimmick to continue milking state resources to replenish his thirst for luxury. New government should be wary of this kind of so-called intellects and megaphone diplomats. Dayarn has gone from nitpicker to a knickerpicker. He definitely needs specialized medical care and attention! That’s rubbish ! You may not like the man for whatever reasons but what was he supposed to do ? Make his stage time uninteresting ? Make his speech bland ? Read the message off like a robot ? Talk substance. Not rubbish ! Excellent Granville; but not nearly enough about this low-life form; these bogus ‘intellectuals’ always talk half-truths, and cannot hide their true intent, which is steal from the poor, appear patriotic and have a great life! I hope you will have more to say about this scum, whose hubris and arrogance, sickens me to death! Dayan, a covert who is trying to talk and show more patriotism (not in real sense) to fool the people, now crying ‘wolf(tiger)’ to get attention. He should use his sixth sense and common sense. Shame to his PhD! I thought DJ was a moderate intellectual who fits well in SriLanka foreign service. Now I look at him as a typical boot licking 3rd class politician who will do whatever is necessary to maintain his luxury life. United people of Sri lanka fought against these stooges in last election and we will do it again if it is necessary. Meanwhile the nation should be careful with Sirasa and Shakthi channels. During the wartime they were with LTTE and now they are playing a game against the present government. Srirranga is always inteviewing the personalities who can talk on behalf of him. A dirty politician-journalist who love to play behind the scenes. May be the Maharaja organization is worried about the international financial fraud investigation with the indian help. Dayan the pretender is a born Racist. He is driven by hatred and the defeat of MR has stopped their march towards Sinhalamisation in its tracks. They are struggling to come to terms with the new reality so it is natural human reaction and all they can do is pour scorn anything and everything that’s is progressive. He takes any insults hurled at him lying down.